Fill pure castor oil in the earthen / bronze diya/deepam. Place thick cotton wicks, pour castor oil & light the diya. 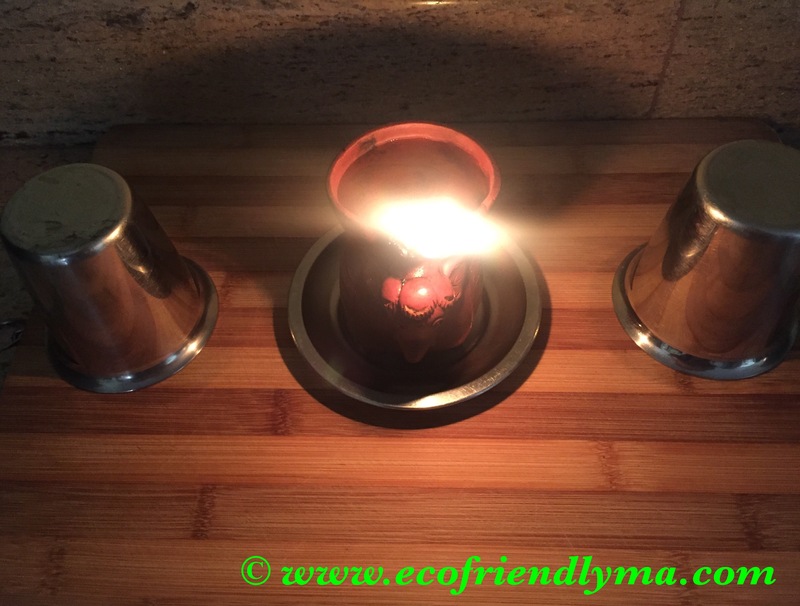 By using two tumblers, support the copper plate on top of the diya. The plate should be high enough to not completely put off the diya light and close enough for the lamp fire to deposit the black soot! If you lie down and observe you can see the fire touching the copper plate making it black. The black soot collected is your kohl. Scrape with a knife & collect using a spoon into a mini glass jar. This Khol powder is damn fine, the particles are extremely minute and is an perfect ingredient for preparing kajal! Why is castor oil good for eye? Burning sensation, redness, pink-eye occuring around the eyelids are some examples of eye aliments associated with inflammtory and infective bacteria. Castor oil is the number one home remedy to cure inflamed eyes. Cures dry eyes – lack of lubrication in the eyes is the major cause of this condition. Signs that indicate you have dry eyes include blurred vision at night, after working on the computer or eye pain after waking up in the morning. One amazing benefit of castor oil is to dissolve cataracts early before it progresses to late stages. In a double boiler melt the beeswax. Switch off the flame & add khol and castor oil, stir and pour into a mini jar like this. Allow to cool and the perfect Kajal is ready! Using a eye liner brush like this or your pointer finger smooth a little Kajal & apply along the eye waterline. Smudge with a eye smudger like this or your pointer finger. This can also be used as eye liner, eye brow liner, eye shadow or can be used to create a smokey eye effect. I am in love with this Kajal and am using it daily. This is completely safe and can be even be used for kids or anyone as all the ingredients used are all-natural, 100% pure & organic ones. And the shelf life of all the ingredients used is soo long that it should last easily for a year or more. I will sell very limited editions of kajal on my facebook buy sell group – eco friendly ma. Interested folks do join the group! For friends abroad do check if your products are safe in EGW skin deep database or download their app Healthy Living.